Earlier this year, the IHSA staff selected the individuals listed below as the Illinois Coaches of the Year in their respective sports. Coaches of the Year are selected based on the results of the 2017-18 school year, as well as other elements such as career success, sportsmanship and contributions to the sport. State coaches of the year then complete further information for the NFHS, which a national committee reviews before selecting eight Section winners in each sport and one National winner in each sport. Illinois is located in NFHS Section 4 along with Indiana, Iowa, Michigan and Wisconsin. 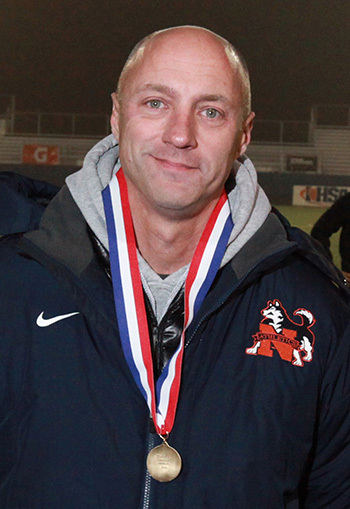 Congratulations to all of the Illinois Coaches of the Year, as well as the four individuals who were selected by the NFHS as Section Coaches of the Year, including Hinsdale Central girls lacrosse coach Dan Hartman, Naperville North boys soccer coach Jim Konrad, Charleston girls golf coach Deb Landsaw, and Hoffman Estates girls bowling coach Dan Pfligler. "Credit for this award must be given to my assistant coaches, players, and supporters of the Hinsdale Central Girls Lacrosse Program. It has been a goal of our program to become one of the premier girls lacrosse programs in the country. This award signals that through the hard work of our players, coaches, and supporters we are on our way to achieving that goal." "Being recognized as the NFHS Coach of the Year for Illinois is one of the highlights of my career. Being selected by organizations like the NFHS and the IHSA is incredibly meaningful to our soccer program and school due to the high standards they set for coaches and athletes. Naperville North truly appreciates and is humbled by this wonderful honor." "I have always tried to promote sports for people of all ages. My main focus has been on getting young people involved in something to get them active and something they can do for their whole lives, however I have also formed ladies teams in the sports of golf, bowling, and softball with the same intent for adults as well. I really like a quote from Vince Lombardi which sums up my belief for the benefits of being in sports. 'Individual commitment to a group effort...that is what makes a team work, a company work, a society work, a civilization work'." "I am very privileged and honored to be selected as one of the NFHS Section Coaches of the Year. This honor means a great deal to me as it shows me that I was able to be a positive role model to many high school bowlers over the past 10 years as a head coach. For the school, it is an honor to present a positive hard-working image to the school that I coach at. For the program, it shows students that the coaches are dedicated to this program and do their best to make it better each year and to help not only the girls be better bowlers, but better people every year."